Emmanuel Kofi Nti, GRA Boss. The GRA is concerned that the wholesale exemptions have resulted in exploitation where some beneficiaries eventually evade taxes completely. The comments also come at a time where the government is enforcing its tax laws. The Commissioner in charge of Domestic Tax Revenue Division, Kwasi Gyimah Asante believes the move should help the government in meeting its revenue target for the year. The mid-year budget review revised the government’s revenue target from 51 to 49.6 billion cedis. 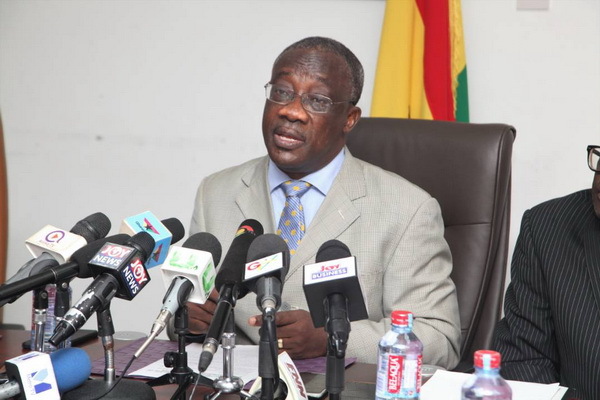 Speaking at a media sensitization on the implementation of the new tax reforms in the midyear budget review, Mr. Gyimah Asante said the action is the best option presently. “This is to minimize the amount of exemptions that are granted and ensure that the volumes that are granted are dealt with to the barest minimum,” he added. The government in 2017 instituted an administrative measure that required exemption holders to pay in advance, all applicable import duties and taxes, and apply for refunds with supporting evidence. The 2018 budget also highlighted efforts to making concrete changes in the tax policy framework particularly on tax exemptions. Meanwhile the Commissioner General of the GRA, Emmanuel Kofi Nti explained to Citi Business News how the Authority is dealing with the issuing of VAT receipts following the recalibration. We will have to start printing new invoices for them to use but while at that, they should go ahead and use the old invoices that they have except that they may have to be able to isolate the various lines; i.e. VAT, NHIL and GETFund lines. This is applicable to both the manual and electronic issuers of VAT,” he explained. The Finance Minister, Ken Ofori Atta has made a projection of raising about 500 million cedis from the new tax policy. Even though there have been concerns that the policy will lead to increase in taxes, Mr. Ofori Atta is hopeful that the impact will eventually be knocked off by reduced inflation.